Summary: Innovations in military technology are central to the US way of war, and has been since WWII. Such innovations have a had a fascinating history. Such as the HMS Warrior, making obsolete much of the skills and traditions of the UK navy — and so fiercely resisted by its officers. Today we have a review of an interesting book discussing how innovation can be fostered and encouraged. Review by Gary W. Anderson (Colonel, USMC, Retired). Several years ago, when I was the chief of staff of the Marine Corps Warfighting Laboratory (MCWL), a young major on the staff came to me with a draft of a project he had been working on for some months. It was a manual for innovation. I wasn’t sure whether to laugh at him or throw him out of the office. To his credit, he hadn’t thought of it himself; someone had told him to do it. It confirmed my suspicion that MCWL was grossly overstaffed. I assigned him to another project. You don’t mandate innovation; innovation happens. 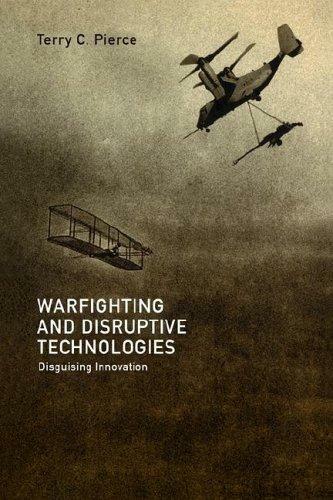 In his book, Warfighting and Disruptive Technologies: Disguising Innovation, CAPT Terry C. Pierce, USN explains why some military innovations work and some do not. He makes a good argument that the most radical innovations are best accomplished when they are portrayed as mere improvements on the status quo rather than radical departures. Pierce pursues his thesis methodically. He explains and debunks a number of competing theories on successful innovation models including one by one of his academic mentors, Dr. Barry Posen. Posen believes that civilian intervention is a major driver in successful military innovation. Posen often uses Hitler’s intervention in the development of German mobile combined arms doctrine. It should be noted that what the Germans used was created by a journalist. Pierce believes that disguised innovations are the most successful form in that they do not overtly challenge the status quo, but rather they appear to enhance it. Once “in the tent,” Pierce contends that these innovations have a tendency to take over from within. In essence, they act like a cuckoo egg. Once hatched, the cuckoo kills the other baby birds and convinces the mother bird to feed and nurture it. The best example of this is in his chapter on the development of Japanese carrier aviation. ADM Isoroku Yamamoto, the product champion, sold the carrier aviation innovation to the battleship admirals who ran the Japanese Navy claiming that the carriers were an enhancement to the battleship Navy. By the time they realized that the vast majority of naval battles in the Pacific in World War II were fought exclusively by carriers, it was too late. The leaders of the big gun club thought they finally had their chance when they sailed into the Philippine Sea after American carrier aviation had evolved and eliminated its Japanese rival. The Japanese battleship fleet was subsequently slaughtered by the American version of the carrier innovation. ADM Hyman Rickover and his singlehanded development of the nuclear Navy is a good example of a sustaining innovation. Rickover never challenged the nuclear deterrent strategy. He sold nuclear submarines as an enhancement to that strategy, and it became the third leg of the nuclear triad. His innovations are legendary. Pierce points out that there is nothing wrong with sustaining innovation until it attempts to stifle breakthrough innovation. Several Marines have been masters at disguising innovation, and this should be what draws Marine readers to the book. Ben Fuller was a master at disguising amphibious warfare as merely an extension of advanced base concepts that had been adopted since the turn of the last century by the Navy and Marine Corps. When World War II broke out, the amphibious force quickly overshadowed the advanced base units that performed heroically in several early battles but were not decisive tools. In a similar vein, Gen Alfred M. Gray disguised innovation in maneuver warfare by selling it as a natural evolution of the Marine Corps style of fighting. Both Gray and Fuller were forced to sacrifice “all or nothing” zealots who would have compromised their disguised innovations. All religions need martyrs and Gray and Fuller provided a few. Martyrs become the saints of me movements. This is true of all new movements. The plodding implementers are often forgotten. Saint Paul and Billy Mitchell will be remembered. The legions of priests who built the Roman Church and the countless action officers of the air staff who were the true builders of American airpower are largely lost to history. Terry Pierce is a long-time friend of the Marine Corps and a maneuver warfare advocate. This book is a revised version of his Harvard doctoral thesis. It is well-written. The reader has to stick with him as he defines terms, but he lays out his arguments clearly and logically. The book is highly recommended. Many active duty Marines will know some of the major players and will be interested for that reason. However, this is a good time for the book to come out. Most commentators believe that the recent decision to keep Defense secretary Donald H. Rumsfeld into the second Bush term is more a result of Bush’s desire to push defense transformation than a reflection of Rumsfeld’s performance as war minister. Because the final shape of transformation is a work in progress, this book is particularly useful. Gary W. Anderson (Colonel, USMC, Retired). He is a defense consultant and a special advisor to the Deputy Secretary of Defense. Although military technology is increasingly available and affordable, not all states have the capacity to improve military effectiveness by acquiring hardware. Integrative difficulties — in command structures, doctrine and tactics, training, and support — are common in the developing world, and many states will have to find some level of innovation to overcome such difficulties if they are to use military technologies effectively. A must-read book for any American interested in geopolitics: Legacy of Ashes by Tim Weiner. The Constitution: wonderful, if we can keep it: If We Can Keep It by Chet Richards. Diagnosing the Eagle, Chapter II — book recommendations for 2008 – Three great books, each telling much about 21st America. Diagnosing the Eagle, Chapter III — reclaiming the Constitution – about Closing of the American Mind by Allan Bloom. Diagnosing the eagle, chapter IV – Alienation – about The Culture of Narcissism by Christopher Lasch. Least we forget: lessons for us from the Battle of Ia Drang – about We Were Soldiers Once… and Young. The Changing Face of War: Lessons of Combat, From the Marne to Iraq, by Martin van Creveld — one of the major books about 4GW. Previous Post The quiet sun is getting a lot of attention. What are its effect on us? Next Post Rolling Stone releases Colonel Davis’ blockbuster report about Afghanistan – and our senior generals!